Ok.... I guess I'll take the starter button and the paddle shifters. Maybe even the rear view camera since we already have the screen for it. After testing one out at the local dealership I can say for certian that steering wheel and paddle shifter setup is a definite must. The Heads up display would be nice but that's probably not realistic. The seats however? blah you can keep em. they look flashy but don't sit or feel any better than the G8 seats. global a ! = commodore ve. I do recall a Grand Prix hack mod where you,could retrofit a hud to an otherwise non-hud-optioned car... maybe 1997-2002 era, anyone remember that? The reason that worked is because the circuits and computer controllers were NOT retooled and/or totally incompatible with the mating car. Like a 99 gp gtp fully loaded with hud totalled out could donate dash and components necessary to install into a virgin dash. same car basically, same generation hardware. Same thing with the grand prix digital dic conversion, which I can proudly claim I successfully implemented. However, looking back, wow, all that work done to gain a "digital engine oil life digital percentage remaining monitor" ... lol. Some may argue that my interior conversion to my g8 is similar... alas, I took it as far as I wanted to and am happy with the interior as she sits. The platform incompatibilies (and probably steering wheel shaft compatibility also) is what you're up against. To my understanding, thats the challenge to overcome here, since you're talking the VE to the VF ,different generation. Till then, my gxp wheel and console mounted bumpstick for manual fits the bill for me. Plug n play for the backup camera mod? Would like to use the LCD screen for something other than black and red radio and XM stations....maybe need the camera with harness and VIM from another vendor? I had a 1999 GP GTP that was only missing the leather seating option. Had everything else however. Yeah, I remember seeing a bunch of guys getting GTP dashes and putting them in their SE grand prixs for the HUD and DIC. Honestly only the HUD was really worth it. I still miss that in the G8 however the information screen in the center of the cluster works pretty well. For us, well all the wiring and such is completely devoid on our cars, so there really isn't any hope of getting an SS dash and just hooking up the HUD to work for us. Enough was changed between VE and VF to make retrofit of anything a tough sell. I checked this car out at the Chicago Auto show and liked it a lot more than I thought. I still don't think it is worth the upgrade given that it will probably cost $30k + trade-in to get. It just so happened that on the way down there one pulled up next to me on the highway. Couldn't play much as there was a lot of traffic, but he definitely knew the g8 and took off a few times. Sure sounds good stock. While at the auto show though, I messed around with it a bit. The seats IMO are nothing special in terms of comfort. I REALLY liked the feel of the paddle shifters and steering wheel compared to my car. I wonder how hard it would be to get the same paddles in the g8. The interior is also quite a bit nicer, although that is to be expected. I would love to have the extra little goodies that the SS offers but every time I look at it, I just can't help but see that price. The g8 was awesome as IMO there was nothing else at that price that really competed with it, the SS, not so much. I like the idea of a factory camera. I don't think it was ever a factory option on the VE. Anyone have pics? Where does it mount? Part #? Pat G Tune, GTPprix's Atari Gauge Mod & OEM Bluetooth & VIM, Leather sliding center console cover, Pace Performance Jack Kit and full size spare, Rotofab CAI and rad cover, Mobil 1 Oil cap, GXP axlebacks. Anyone know if the stock SS mufflers are a direct bolt on for the G8? The gxp mufflers have skyrocketed in price and I'm wondering if this would a viable option. Different connections. I think the shape is right, but youd have to weld the pipe or add a flange to the mufflers. this is correct, the SS mufflers are connected to the midpipes and are not a separate peice like the GT and GXP setup. Vararam, OBX Longtubes and Catback, Kooks Axelbacks, RCR Thumper cam, LS3 heads, RCR tuned, Brembo Brakes all around, GXP front end conversion, GXP FE3 suspension, Eibach Springs. Did anyone mention the SS shift paddles can be retrofitted into the G8? Old yhread, but its cool to read through everything and see how things have actually progressed in the real world. Also cool to see some guys' guess what would happen to the SS. Like magnetic suspension and 6-speed manual option. 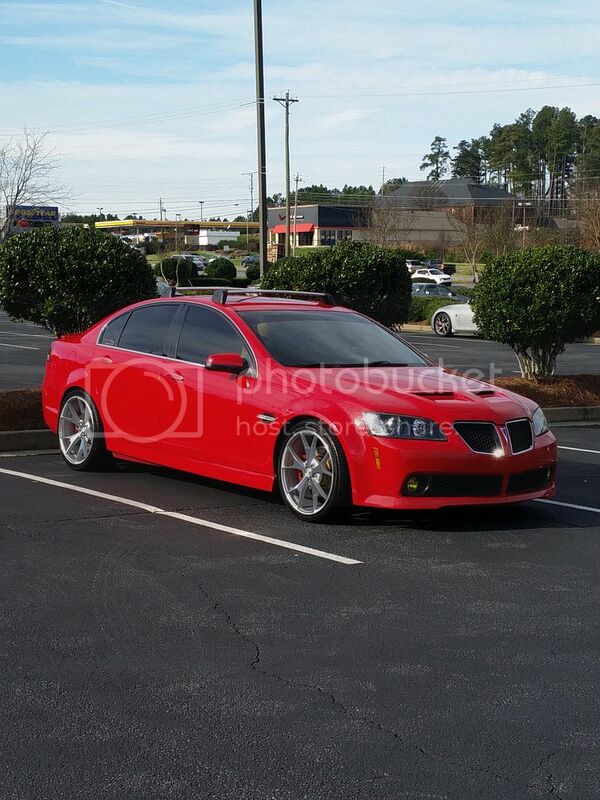 I know ive seen at least one guy with SS wheels on their G8. It looked pretty good. Unfortunately, a "souped up" version is a pipe dream. A 2017 model will probably happen, but its not even definite. An LSA powered SS would be stupid expensive and also probably very difficult to even acquire because of the crazy low production numbers. Sorry to open an old thread, tried searching with no luck, can anyone confirm if the SS A6 shifter and bezel directly fit the G8? Or if you can do a swap using the entire SS shifter setup?